The new Mazda6 has been designed to garner admiring glances while changing the perception of what an economical sedan can do. Experience affordable opulence today at Continental Mazda of Naperville. 2019 Mazda Mazda6 Sport In Deep Crystal Blue Mica. 26/35 City/Highway MPG Thank you for considering Continental Mazda for your next vehicle! We are proud members of the exclusive Naperville Test Track. Stop by today for your best test drive experience ever - really! With over 50 years of satisfied customers, we guarantee hassle-free satisfaction with our 72-hour vehicle exchange policy. Proudly Serving: Naperville, Oakbrook, Chicago, Joliet, Aurora, Downers Grove, Wheaton, Schaumburg, and greater Chicago Illinois. 2018 Mazda Mazda6 Grand Touring In Snowflake White Pearl Mica. 23/31 City/Highway MPG Thank you for considering Continental Mazda for your next vehicle! We are proud members of the exclusive Naperville Test Track. Stop by today for your best test drive experience ever - really! With over 50 years of satisfied customers, we guarantee hassle-free satisfaction with our 72-hour vehicle exchange policy. Proudly Serving: Naperville, Oakbrook, Chicago, Joliet, Aurora, Downers Grove, Wheaton, Schaumburg, and greater Chicago Illinois. 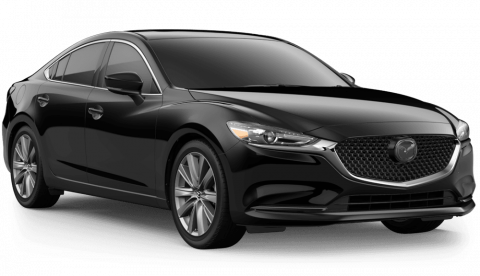 2019 Mazda Mazda6 Touring In Jet Black. 26/35 City/Highway MPG Thank you for considering Continental Mazda for your next vehicle! We are proud members of the exclusive Naperville Test Track. Stop by today for your best test drive experience ever - really! With over 50 years of satisfied customers, we guarantee hassle-free satisfaction with our 72-hour vehicle exchange policy. Proudly Serving: Naperville, Oakbrook, Chicago, Joliet, Aurora, Downers Grove, Wheaton, Schaumburg, and greater Chicago Illinois. 2018 Mazda Mazda6 Grand Touring In Crystal Blue. 23/31 City/Highway MPG Thank you for considering Continental Mazda for your next vehicle! We are proud members of the exclusive Naperville Test Track. Stop by today for your best test drive experience ever - really! With over 50 years of satisfied customers, we guarantee hassle-free satisfaction with our 72-hour vehicle exchange policy. Proudly Serving: Naperville, Oakbrook, Chicago, Joliet, Aurora, Downers Grove, Wheaton, Schaumburg, and greater Chicago Illinois. 2018 Mazda Mazda6 Grand Touring In Soul Red Crystal Metallic. 23/31 City/Highway MPG Thank you for considering Continental Mazda for your next vehicle! We are proud members of the exclusive Naperville Test Track. Stop by today for your best test drive experience ever - really! With over 50 years of satisfied customers, we guarantee hassle-free satisfaction with our 72-hour vehicle exchange policy. Proudly Serving: Naperville, Oakbrook, Chicago, Joliet, Aurora, Downers Grove, Wheaton, Schaumburg, and greater Chicago Illinois. 2019 Mazda Mazda6 Grand Touring In Machine Gray Metallic, Android Auto / Apple CarPlay Integration. 23/31 City/Highway MPG Thank you for considering Continental Mazda for your next vehicle! We are proud members of the exclusive Naperville Test Track. Stop by today for your best test drive experience ever - really! With over 50 years of satisfied customers, we guarantee hassle-free satisfaction with our 72-hour vehicle exchange policy. Proudly Serving: Naperville, Oakbrook, Chicago, Joliet, Aurora, Downers Grove, Wheaton, Schaumburg, and greater Chicago Illinois. 2019 Mazda Mazda6 Grand Touring In Machine Gray. 23/31 City/Highway MPG Thank you for considering Continental Mazda for your next vehicle! We are proud members of the exclusive Naperville Test Track. Stop by today for your best test drive experience ever - really! With over 50 years of satisfied customers, we guarantee hassle-free satisfaction with our 72-hour vehicle exchange policy. Proudly Serving: Naperville, Oakbrook, Chicago, Joliet, Aurora, Downers Grove, Wheaton, Schaumburg, and greater Chicago Illinois. 2019 Mazda Mazda6 Grand Touring In Soul Red Crystal Metallic. 23/31 City/Highway MPG Thank you for considering Continental Mazda for your next vehicle! We are proud members of the exclusive Naperville Test Track. Stop by today for your best test drive experience ever - really! With over 50 years of satisfied customers, we guarantee hassle-free satisfaction with our 72-hour vehicle exchange policy. Proudly Serving: Naperville, Oakbrook, Chicago, Joliet, Aurora, Downers Grove, Wheaton, Schaumburg, and greater Chicago Illinois. 2019 Mazda Mazda6 Grand Touring In Soul Red Crystal Metallic, Android Auto / Apple CarPlay Integration. 23/31 City/Highway MPG Thank you for considering Continental Mazda for your next vehicle! We are proud members of the exclusive Naperville Test Track. Stop by today for your best test drive experience ever - really! With over 50 years of satisfied customers, we guarantee hassle-free satisfaction with our 72-hour vehicle exchange policy. Proudly Serving: Naperville, Oakbrook, Chicago, Joliet, Aurora, Downers Grove, Wheaton, Schaumburg, and greater Chicago Illinois. 2019 Mazda Mazda6 Grand Touring Reserve In Deep Crystal Blue Mica, Android Auto / Apple CarPlay Integration. 23/31 City/Highway MPG Thank you for considering Continental Mazda for your next vehicle! We are proud members of the exclusive Naperville Test Track. Stop by today for your best test drive experience ever - really! With over 50 years of satisfied customers, we guarantee hassle-free satisfaction with our 72-hour vehicle exchange policy. Proudly Serving: Naperville, Oakbrook, Chicago, Joliet, Aurora, Downers Grove, Wheaton, Schaumburg, and greater Chicago Illinois. 2019 Mazda Mazda6 Grand Touring Reserve In Snowflake White Pearl Mica. 23/31 City/Highway MPG Thank you for considering Continental Mazda for your next vehicle! We are proud members of the exclusive Naperville Test Track. Stop by today for your best test drive experience ever - really! With over 50 years of satisfied customers, we guarantee hassle-free satisfaction with our 72-hour vehicle exchange policy. Proudly Serving: Naperville, Oakbrook, Chicago, Joliet, Aurora, Downers Grove, Wheaton, Schaumburg, and greater Chicago Illinois. 2019 Mazda Mazda6 Grand Touring Reserve In Machine Gray Metallic. 23/31 City/Highway MPG Thank you for considering Continental Mazda for your next vehicle! We are proud members of the exclusive Naperville Test Track. Stop by today for your best test drive experience ever - really! With over 50 years of satisfied customers, we guarantee hassle-free satisfaction with our 72-hour vehicle exchange policy. Proudly Serving: Naperville, Oakbrook, Chicago, Joliet, Aurora, Downers Grove, Wheaton, Schaumburg, and greater Chicago Illinois. 2019 Mazda Mazda6 Grand Touring Reserve In Soul Red Crystal Metallic, Android Auto / Apple CarPlay Integration. 23/31 City/Highway MPG Thank you for considering Continental Mazda for your next vehicle! We are proud members of the exclusive Naperville Test Track. Stop by today for your best test drive experience ever - really! With over 50 years of satisfied customers, we guarantee hassle-free satisfaction with our 72-hour vehicle exchange policy. Proudly Serving: Naperville, Oakbrook, Chicago, Joliet, Aurora, Downers Grove, Wheaton, Schaumburg, and greater Chicago Illinois. 2019 Mazda Mazda6 Grand Touring Reserve In Soul Red Crystal Metallic. 23/31 City/Highway MPG Thank you for considering Continental Mazda for your next vehicle! We are proud members of the exclusive Naperville Test Track. Stop by today for your best test drive experience ever - really! With over 50 years of satisfied customers, we guarantee hassle-free satisfaction with our 72-hour vehicle exchange policy. Proudly Serving: Naperville, Oakbrook, Chicago, Joliet, Aurora, Downers Grove, Wheaton, Schaumburg, and greater Chicago Illinois. 2019 Mazda Mazda6 Signature In Crystal Blue. 23/31 City/Highway MPG Thank you for considering Continental Mazda for your next vehicle! We are proud members of the exclusive Naperville Test Track. Stop by today for your best test drive experience ever - really! With over 50 years of satisfied customers, we guarantee hassle-free satisfaction with our 72-hour vehicle exchange policy. Proudly Serving: Naperville, Oakbrook, Chicago, Joliet, Aurora, Downers Grove, Wheaton, Schaumburg, and greater Chicago Illinois. 2019 Mazda Mazda6 Signature In Sonic Silver Metallic. 23/31 City/Highway MPG Thank you for considering Continental Mazda for your next vehicle! We are proud members of the exclusive Naperville Test Track. Stop by today for your best test drive experience ever - really! With over 50 years of satisfied customers, we guarantee hassle-free satisfaction with our 72-hour vehicle exchange policy. Proudly Serving: Naperville, Oakbrook, Chicago, Joliet, Aurora, Downers Grove, Wheaton, Schaumburg, and greater Chicago Illinois. 2019 Mazda Mazda6 Signature In Jet Black Mica, Nappa Leather Interior, ABS brakes, Active Cruise Control, Alloy wheels, Electronic Stability Control, Front dual zone A/C, Heated door mirrors, Heated front seats, Heated rear seats, Illuminated entry, Low tire pressure warning, Nappa Leather Seat Trim, Navigation System, Power moonroof, Remote keyless entry, Traction control. 23/31 City/Highway MPG Thank you for considering Continental Mazda for your next vehicle! We are proud members of the exclusive Naperville Test Track. Stop by today for your best test drive experience ever - really! With over 50 years of satisfied customers, we guarantee hassle-free satisfaction with our 72-hour vehicle exchange policy. Proudly Serving: Naperville, Oakbrook, Chicago, Joliet, Aurora, Downers Grove, Wheaton, Schaumburg, and greater Chicago Illinois. 2019 Mazda Mazda6 Signature In White. 23/31 City/Highway MPG Thank you for considering Continental Mazda for your next vehicle! We are proud members of the exclusive Naperville Test Track. Stop by today for your best test drive experience ever - really! With over 50 years of satisfied customers, we guarantee hassle-free satisfaction with our 72-hour vehicle exchange policy. Proudly Serving: Naperville, Oakbrook, Chicago, Joliet, Aurora, Downers Grove, Wheaton, Schaumburg, and greater Chicago Illinois. 2019 Mazda Mazda6 Signature In Snowflake White Pearl Mica. 23/31 City/Highway MPG Thank you for considering Continental Mazda for your next vehicle! We are proud members of the exclusive Naperville Test Track. Stop by today for your best test drive experience ever - really! With over 50 years of satisfied customers, we guarantee hassle-free satisfaction with our 72-hour vehicle exchange policy. Proudly Serving: Naperville, Oakbrook, Chicago, Joliet, Aurora, Downers Grove, Wheaton, Schaumburg, and greater Chicago Illinois. 2019 Mazda Mazda6 Signature In Machine Gray. 23/31 City/Highway MPG Thank you for considering Continental Mazda for your next vehicle! We are proud members of the exclusive Naperville Test Track. Stop by today for your best test drive experience ever - really! With over 50 years of satisfied customers, we guarantee hassle-free satisfaction with our 72-hour vehicle exchange policy. Proudly Serving: Naperville, Oakbrook, Chicago, Joliet, Aurora, Downers Grove, Wheaton, Schaumburg, and greater Chicago Illinois. 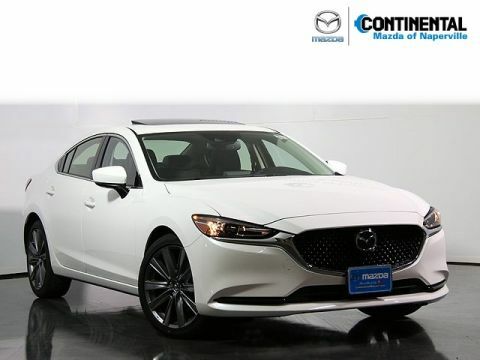 If you are in search of sedan that doesn’t break the bank but has all of the style and sophisticated touches you desire, look no further than a Mazda6 for sale at Continental Mazda of Naperville. In addition to its good looks, the latest Mazda6 model has been designed with innovative safety in mind, which is evident by its IIHS Top Safety Pick+ distinction (when properly equipped). Add in all of its advanced tech features, and the choice is clear. Why wait to set up your test drive? Experience the Mazda6 in Naperville today at Continental Mazda of Naperville. Just what can you expect when you take a new Mazda6 for a spin? You can look forward to an adrenaline-pumping drive that may surprise you. The Mazda6 is equipped with a 2.5L engine featuring SKYACTIV® TECHNOLOGY, which delivers 184 hp and 185 lb-ft of torque. Its aerodynamic design is not only visually appealing, but functional as well, contributing to outstanding fuel economy and high-speed stability. If the new Mazda6 has piqued your interest, check out our payment calculator, or stop by Continental Mazda of Naperville today to experience it in person.